A minimal theme for bloggers. Steam is a minimal and customizable theme for bloggers and was developed by Tommaso Barbato. He created it as a slightly adapted version of the Vapor Ghost theme by Seth Lilly. Noteworthy features of this Hugo port are the integration of a comment-system powered by Disqus, the customizable appearance by changing theme colors, support for RSS feeds, syntax highlighting via Highlight.js for source code and the optional use of Google Analytics. Enough to read. Let’s take the first steps to get started. 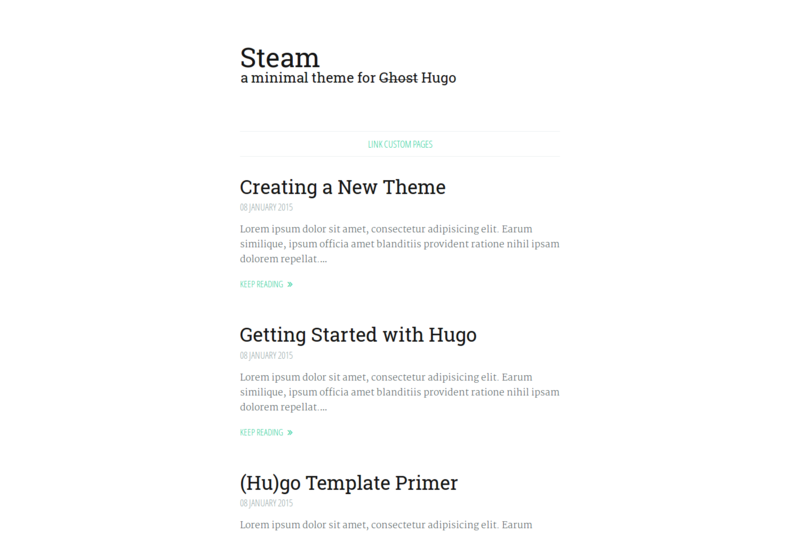 This theme features four different theme colors (green as default, blue, red and orange) that change the appearance of you Hugo site slightly. Just set the themeColor variable to the color you like. Furthermore you can create your own theme. Under layouts/partials/themes you’ll find a stylesheet template called custom-theme.html. Customize the colors as you like and save the new theme with the schema <myNewColor>-theme.html within the same folder. As you can see, the color is the prefix of the stylesheet template. Therefore you just need to set themeColor in the configs) to that self-defined prefix. This theme features a comment system powered by Disqus. To enable it you have to add your Disqus shortname to the disqusShortname variable in the config file.